Have you snacked on insects, worms, or bugs? Welcome to Thailand, where snacking is not only a way to satisfy your craving, but it’s a leisure way of life. Throw away your artificial bag of chips and preserved cookies, because fresh bugs are widely available and waiting to be your next snack! 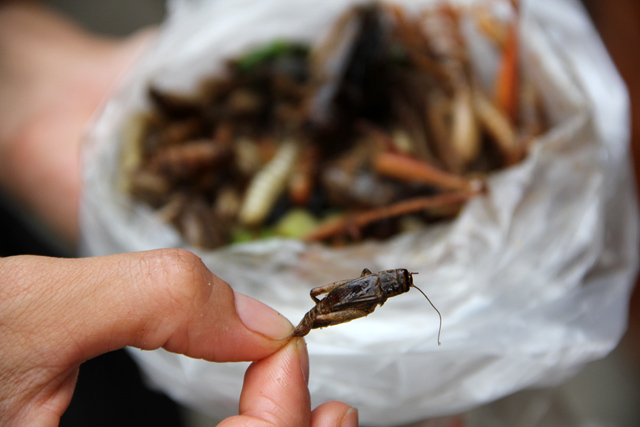 Sometimes edible insects are cooked within certain Thai dishes, but most of the time they are deep fried until reaching a complete state of crispiness, heavily salted, and eaten as a protein enriched snack. Throughout Thailand you’ll be able to locate carts piled high with freshly cooked bugs, and grabbing an exotic snack is one of the top things to do while you’re in Bangkok! It’s like a mass bug graveyard, abundant piles of creatures on big platters. An insect cart in Thailand will often include 5 – 10 different choices. 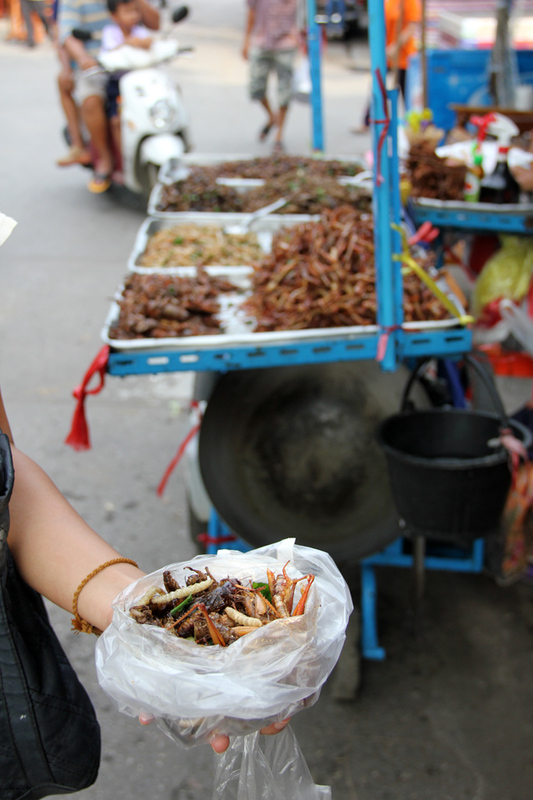 Many of the street food insect carts are attached to portable motorbikes or bicycles so they can cruise around to find customers, who are often beer drinkers craving salty snacks. Bat full of edible insects, worms, and bugs! To order you simply point and choose to whatever bite sized bugs look the most attractive. 20 THB will get you a small snack, but this time around I ordered a mixed bag full of 100 THB worth of bugs – and believe me, it was way too much for two of us. 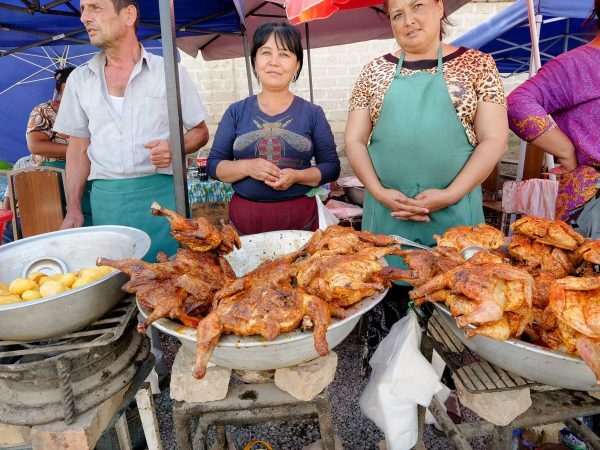 Once you’ve chosen your bag of insects, worms, and bugs, the vendor will normally give them a mist of soy sauce from a spray bottle and a dash of pepper to top them off. While eating dog and cat can cause some phsycological trauma, bugs on the other hand are much less nerve racking to eat. Some of them are a little scary looking, but just keep in mind that they are all safe and harmless to devour! What kind of bug may I serve you? They are all prepared in a very similar fashion, deep fried to a crisp and nicely salted. Grasshoppers are one of the top attractions on any Thai bug cart. Most of them are around 10 centimeters or so in length and are cooked fully in tact. Eating Method: Plop the entire grasshopper into your mouth in a single bite. How Does It Taste: Forget about potato chips, these guys are way crunchier, more like a deep fried piece of pork skin yet much lighter and airy. Grasshoppers do have a little bit of a bug flavor, but mostly take on the flavor of salt and pepper. As soon as you bite down, the entire carcass of grasshopper is reduced kind of like Cheetos. 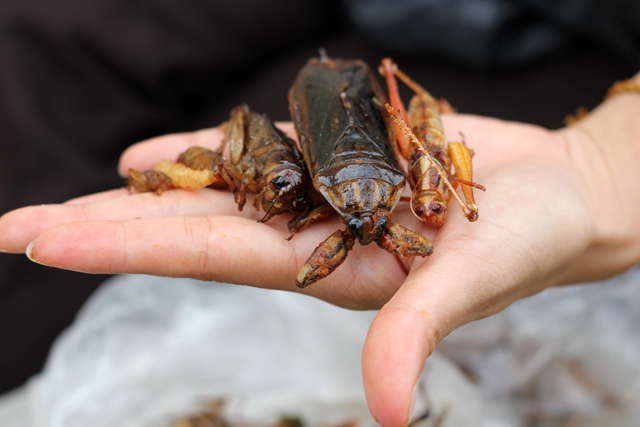 Giant water bugs in Thailand are known as maeng daa (แมงดา), and their essence is commonly extracted and added to special Thai nam prik chili sauces. I have also eaten them in boiled form which makes for quite an interesting snack. Eating Method: In order to eat a giant water bug you need to first amputate the hard outer wings. Pull them off before digging into the meat and eggs of the body, and finally fish out all the meat from the head. How Does It Taste: Giant water bugs have a highly distinct flavor that is reminiscent of black licorice or anise. The body is a bit juicy, and to me it tastes a bit like scrambled eggs, while the head tastes more like sour mushy crab. I don’t actually know what these bugs are, I just know they look pretty scary and appear to be crickets gone wild! Big bulging eyes and gnarly legs and claws make these crickets on steroids a little frightening to look at. Eating Method: The entire bug is edible, so just go ahead and toss the entire thing in your mouth. 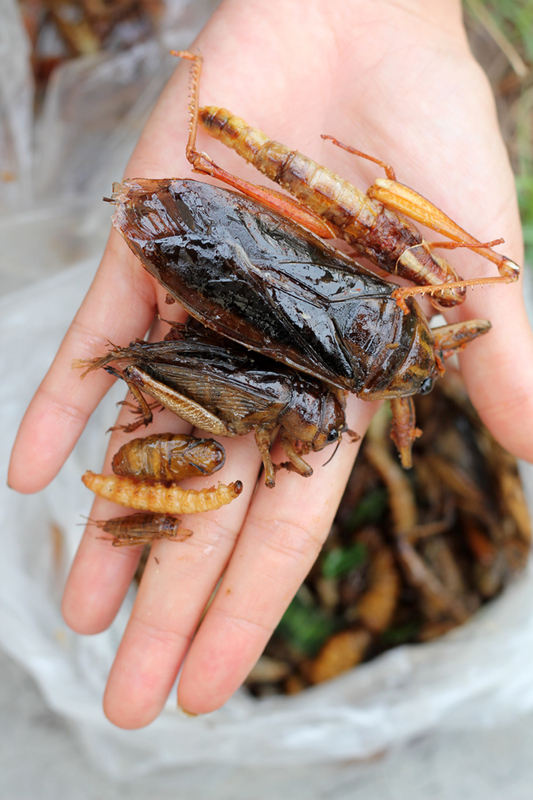 How Does It Taste: These crickets on steroids have some seriously razor sharp legs. When I was eating them I nearly cut the inside of my mouth. Flavor wise they weren’t anything special, far less tasty than a grasshopper, and the crunchiness didn’t permeate through the entire body, leaving some parts mushy instead of crispy. Perhaps it would be beneficial to pull off the nasty legs prior to consumption. 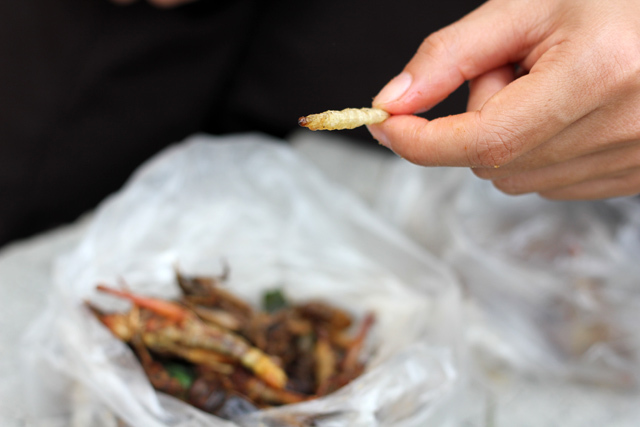 Silk worm in Thailand are deep fried but they are the least crispy bug of this snack. These little 1 to 2 centimeter worms are kind of like fried little mashed potatoes or gnocchi pasta (Italian potato pasta) bites. Eating Method: Silk worm are like little pills, you swallow the entire thing, and they really go down quite easily. How Does It Taste: Silk worms have a very familiar nutty taste, almost peanut-ty I would say. Like I mentioned, they are the texture of mashed potatoes or mushed mungbeans. Just like all the other insects and bugs on this list, they take on the heavily salted flavor. Another Thai favorite bug to eat are thin white bamboo worms which are about 2 – 3 centimeters in length. If you’re not excited about eating bugs, but still want to say you did it, I’d recommend having a sample of bamboo worms. They are very neutral tasting and if you didn’t know they were worms, you may think it was just a cheese-less Cheeto. 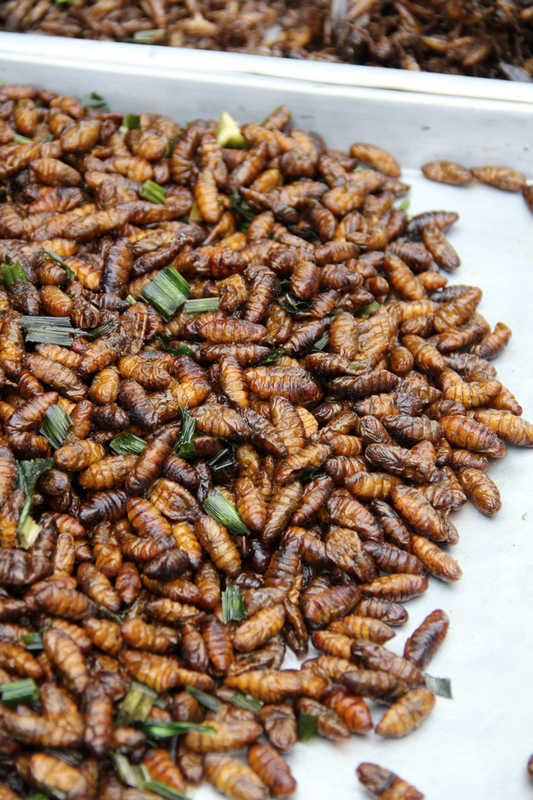 Eating Method: Just like the other silk worms, you just pop these guys like you’re munching on popcorn at a movie. How Does It Taste: They really don’t have a distinct flavor to me, and eating them is quite similar to eating popcorn in both taste and texture. Normal sized crickets, as opposed to their steroid pumped up counterparts, are small and innocent looking without being ferociousness. They are about the same size as silk worms, 1 – 2 centermeters in length. Eating Method: Again, the whole thing is edible, so just go ahead and grab a handful and start snacking. How Does It Taste: Crickets indeed have a rather strong bug flavor. Imagine what a bug might taste like, and that’s exactly how a cricket tastes. Crickets also give a slight dryness to the mouth, almost like a sip of dry wine. What’s the best tasting bug? Silk worms are pretty decent, bamboo worms are even better, but I got to give my award to grasshoppers. 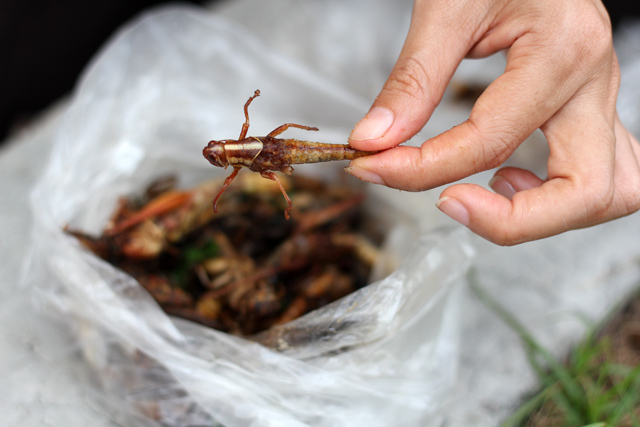 In my opinion, they are the crunchiest and best flavored bug of the entire Thai edible insect repertoire. None of the bugs are bad, in reality most of the bugs are far less flavorful than you would imagine, and are simply just crispy and salty. 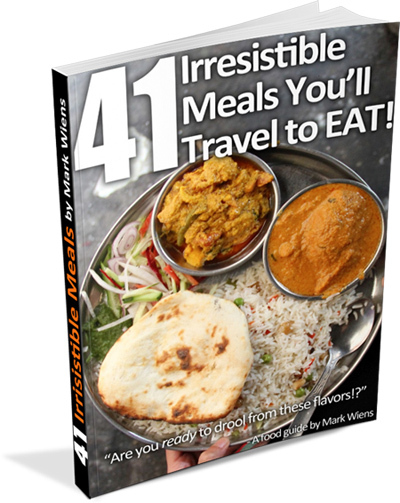 There you have the ultimate guide to eating insects, worms, and bugs in Thailand. There are also many more edible creatures like red ants (which I particularly love) and scorpions as well, but these are the standard bugs included on many of the snacking carts. So grab a bag of bugs now! 67 comments. I'd love to hear from you! Hello, I am a Medical student who work on EMSC web page , Emsc is association of many national medical students working and sharing ideals with each others. And I would like to take some idea of your website to write in our website and also some of your photos. Is it possible for us ? Let me know ,if you agree. Look forward for your kindness , thank you. I suggest you. Don’t eat bugs. delicious,but very dangerous. many bugs die with DDT.I go to hospital because DDT in grasshopper. The ant salad I had is probably the least scary insect recipe to eat in Thailand. It was fried flying ants of different sizes and mixed with chopped lemongrass and coriander, severd in a banana leaf. I was offered a variation on this, where the ants were still alive. The ants crawled away before I had found the courage to eat them. Hi Mark, I love your website and your videos! I’m going to Thailand this Christmas for a few weeks to do some research for my Master degree on edible insects. Basically I’m going there to try insects and learn about the insect eating culture in Thailand. Do you have any tips on different dishes which you think are worth trying? Or markets where they are most available? Places where it is commonplace to eat them routinely as part of the diet? It would be a big help. One of my aims is to compile some sort of insect recipe book, and I must try as many different dishes out there as possible (not only deep-fried snacks). If you know where I can go, please let me know! Thank you so much. I’ll be sure to get your e-books before going to Thailand. I have to do all my fieldwork in a short period of time, so all the help counts. Hey Sarah, glad you’ll be coming to Thailand to do some research – that’s a really cool topic, and that will be a lot of fun as well. 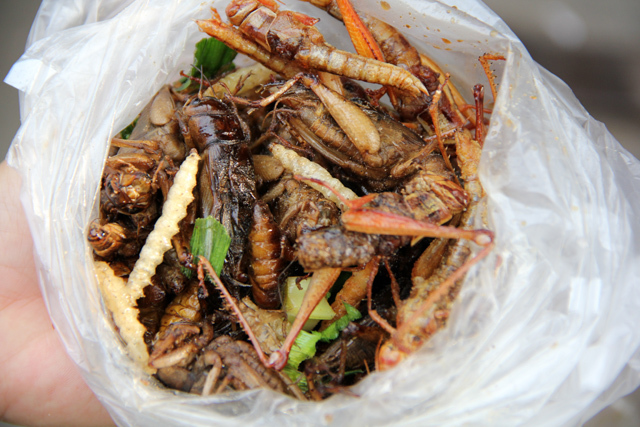 Insects are most commonly eaten in northern and northeastern Thailand (Isaan), but you can still find them in Bangkok, but not as much. 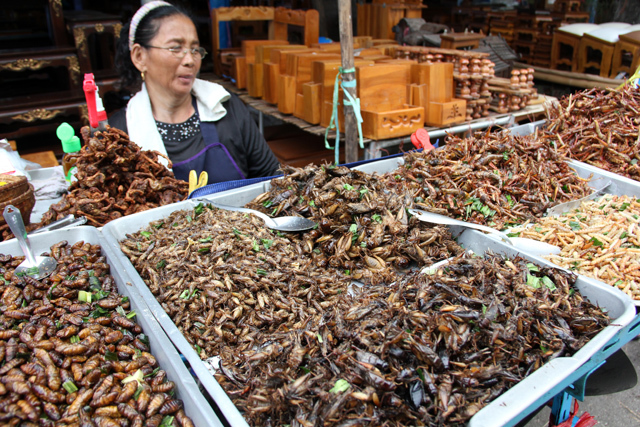 Lots of the insects are just deep fried and eaten as snacks, but they are also sometimes used in “nam prik” chili dips, or can even be stir fried sometimes. Maybe once you arrived in Thailand send me a message and we can try to connect. Thanks so much for your help. I’ll be sure to send you a msg when I’m in Thailand 😉 I’m going to look up what I can about Isaan. If you could point me to any markets or insect rearing farms, that would be amazing. 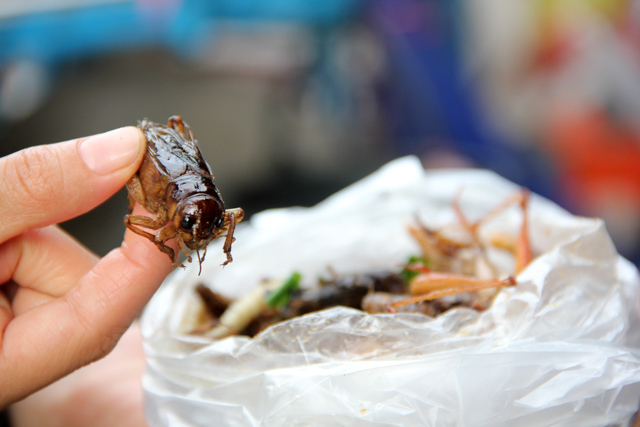 I just arrived Bangkok 3 months ago, Yes, I was so surprised at various eaten insects. I just dared to choose an insect – a Giant Water Bug. I remember i took all the meat out of the body and ate. It tasted like watery scrambled eggs with a strong black liquorice flavor. To no avail, I tried to convince my hosts that for every dragon fly larvae we were eating we were allowing a thousand mosquitoes to live and feed on us. The dragon fly larvae are very tasty however! Haha, hope you get a chance to try them sometime! In my last Thailand holiday I tried the bamboo worms once. It tasted not bad. The others like Grasshoppers, Giant water bugs or Crickets on steroids. I was equally bad then. Hey David, glad you got some bamboo worms, they really are quite tasty! *mental notes to self*: Must remember to pull of legs. Way to go ! One must be bold enough to eat these exotic stuff.I would rather see them crawling in my backyard than have them sizzling on my platter. Hey Aynzan, ahahaha, yup they are all potential creatures that could be found crawling around any backyard! Brilliant post! I studied entomology in college, and love bugs though I’ll break my vegetarianism to eat them when I find them 🙂 I wouldn’t have the guts to try any of those larger bugs. Hey Cassie, haha, yes, getting legs stuck in your teeth is an issue! Glad you’ve tried some of these bugs already! The grasshopper and the bamboo worms are the only ones I had the courage to try. And they’re actually pretty good. The big water bugs, though. Naaaaah. Haha. You made some good choices Paul! Those are the two best! Hey Bridget, glad you’ve tried the grasshopper, that’s the best tasting of them all! Mark, I know it might sound crazy, but I had them all during my last visit in Thailand and I am going to have them again in two weeks. Grasshoppers are my favourite ones! So crispy, but too oily. I used to put a lot of salt on the top to make them taste better. I know many people who hate eating them, but for me it was a real treat! Hey, great to hear that Agness! They are very good, and the only reason I don’t eat them often is because they are too oily. I agree, grasshoppers are the best! I agree with Alex, the scorpions are great. Nice and crunchy! Good to hear that Don. Would love to try them! 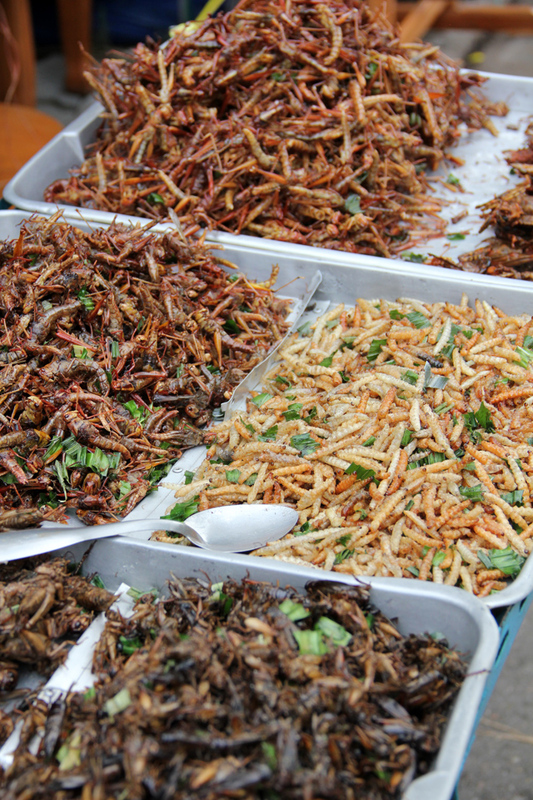 Can i know which market do you go to taste this insects? Hi Cristal, this was actually in Nakhon Pathom, about 1 hour away from Bangkok. In Bangkok you normally have to locate these types of insects either at night markets or on roaming motorbike vendors. Hope you can find some! I only touch one when I was in South-East Asia; to eat them I did not have the guts :D. I might try next time but to be honest I prefer normal food. Did you feel well after you eat it? Hey Sorin, thanks for sharing, Yes felt completely normal and very well after eating them! Ha, thanks for looking Maria! A shame you only went for the big, photogenic stuff. Many kinds of larvae are quite delicious as are bees. Be advised, readers, that many times insects are not simply netted, but killed with pesticides which preparation and cooking do not completely remove. Hi Darryl, yes there are plenty of other bugs and larvae that ar delicious. I particularly enjoy red ant eggs, in both soups and omelets. However this article highlights the insects that are normally included on many of the roaming snack carts. Thanks for the head up about pesticides. Hey Sarah, yah bamboo worms are excellent! These water bugs are better fried like this. I’ve had them a few times boiled and while they are alright, they kind of taste like bad scrambled eggs! Number 3 is จักกจัน (jahk jahn), which I’m pretty sure is a cicada. The water bug was the hardest for me to eat, I felt sick just putting it in my mouth (looks too much like a giant cockroach for me). Bamboo worms are pretty good, just like French fries! I did on the other hand LOVE scorpions, even though they aren’t insects. It tasted like oysters. Hey Alex, cool, thanks for the identification. Those guys have some sharp claws! Do you like the essence of maeng da when it’s in a nam prik? I like pretty well in nam prik. I still haven’t ever had a scorpion, but will try it at any opportunity I have in the future! Haven’t tried maeng da in nam prik. After trying it plane and gagging, I decided it just wasn’t for me! 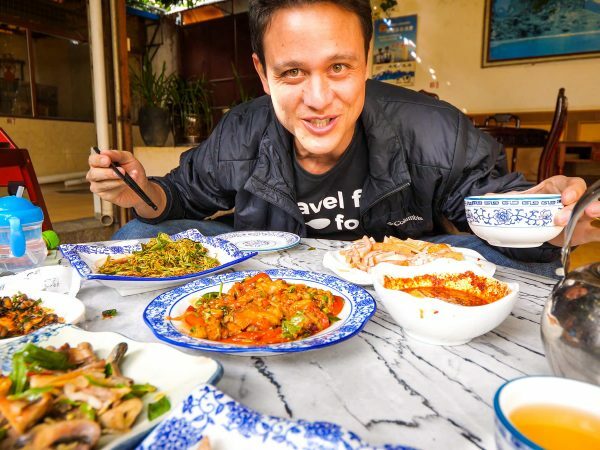 Hit us up if you come up to Chiang Mai and we’ll show you enough awesome local food for you to gain 10 pounds in a weekend! Haha, thanks a lot Alex, looking forward the some weight gaining! I understand Dean. 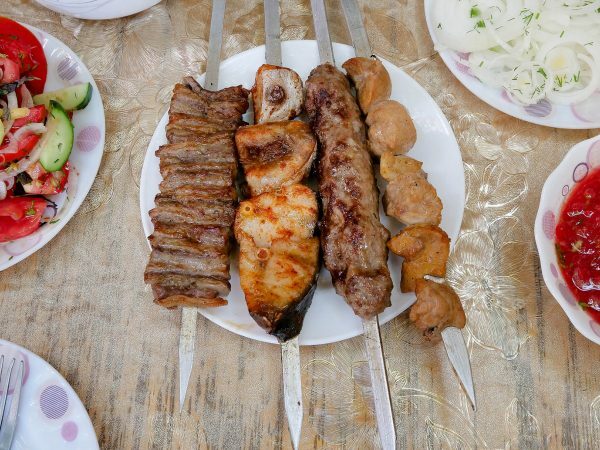 Other than just having the curiosity about what bugs taste like, I would always go for the grilled pork too! I really do not think I could eat those really large insects. It’s one thing to pop something small in your mouth, but when you have to CHEW… the thought of that is already hitting my gag reflex. I think this would be my biggest challenge traveling in that part of the world. I would WANT to try them, but I don’t know if I could get over the gross-out factor. Hey Stephanie, I think you would really like the bamboo worms. There’s almost no chewing necessary and they really do kind of taste like popcorn! Thanks Marianne, I appreciate you leaving a comment. The good thing about the water bugs is that you pull off the wings and pull apart the body and just kind of eat what’s inside, instead of chomping on the whole thing. But I still think grasshoppers are my favorite!